Use this page to learn about constructing an investment portfolio. Find out how exchange traded funds can be used to diversify your portfolio by choosing asset classes that match your risk reward profile. We use the term portfolio to mean a collection of investment assets (typically stocks, bonds, funds). It represents all your financial assets, generally not material possessions or your primary residence. Constructing a portfolio involves choosing specific assets and their proportions. Your portfolio will be a recipe with just the right mix of ingredients that fit your appetite for risk. The task seems daunting because the possibilities are endless. Its not that hard if you reduce your choices to a reasonable subset of the overall investment universe. There are about 9000 mutual and exchange traded funds and thousands more stocks and bonds. 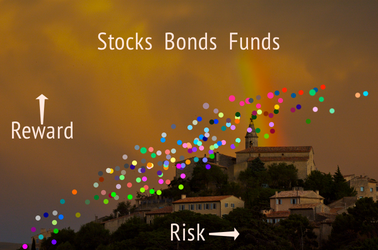 Think of the dots in the risk/reward diagrams as representing your choices. Many of them are similar, so you don't need them all. Eliminating individual stocks and bonds is a good first step since using mutual or exchange traded funds is an efficient way to diversify a portfolio. Choosing from low cost index funds is ideal for most investors. Registered investment advisors often take this approach when building client portfolios. This spectrum of choices is more than adequate unless the portfolio is valued in the millions. This last point is important. The 1990 Nobel prize in economics was awarded for this concept, which is the basis for modern portfolio theory. The key idea is to choose a mix of individual investments resulting in the highest expected return while keeping the overall portfolio at an acceptable level of risk. Such a portfolio will be optimal with respect to risk/reward tradeoff. 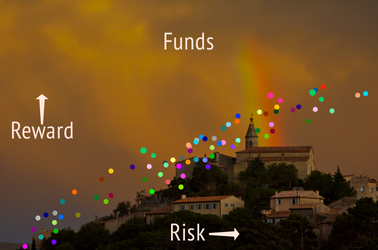 Its location in the risk/reward diagram will fall on the efficient frontier, the curve that represents the best possible reward for each level of risk. You may have never though of your assets as being part of a portfolio. Your investment account at a brokerage, your workplace 401k, that dusty old IRA rolled over from a previous employer and similar accounts are where you begin. The first thing to do is to evaluate what you currently have. Keep the concepts described in Risk/Reward in mind when reviewing the initial state of your investments. Everybody has a different starting point. Consider the analogy of building a house. Existing house, a mess that needs to be demolished perhaps reusing the old foundation. The decisions for a new paint job are certainly easier than those for building a house from scratch. It's a good idea to begin with that new house mentality. Be willing to start over if necessary. Suppose you sold all of your investments and had a pile, hopefully a big pile, of cash ready for new investment. What should you buy? This discussion has nothing to do with picking individual stocks. It is all about diversification and choosing asset classes. Simply put, diversification means that you don't put all your eggs in one basket. Refer to this Investopedia article for a refresher about asset classes. First try to categorize the investments you already have. See if you can identify their asset classes. The Yahoo finance site is a useful resource. You can find the company profile for mutual funds and exchange traded funds. Enter the ticker symbol (or do a lookup) then find the "profile" link. You will have to dig a little deeper if you have proprietary funds or individual stocks. Now let's do that "build a house on a new lot" exercise. Assume that you start with cash equal to your full portfolio value. If it's a really big pile, you can go to an architect to design a nice custom home, maybe even with custom furniture. Buy, hey there aren't many of us that can commission a Frank Lloyd Wright house. If there were such a thing as a "Frank Lloyd Wright portfolio" it would have lots of individual stocks and bonds and various proprietary investments. On the other extreme your new house might be a mobile home. Everything in one package. An investment analogy is a so-called target date fund -- set a date and everything else is on automatic. Easy, but you should at least consider other options. Some target date funds have high fees, so be careful. Some place between these extremes is the right place for most of us. The next few sections offer some ideas of how to proceed. A basic portfolio can be constructed using three exchange traded funds (ETF) as outlined in this Motley Fool® article. The portfolio is a diversified mix of US stocks and bonds and foreign stocks. Your risk tolerance helps determine the proportions among the three ETFs. This is a quite reasonable starting point for someone new to investing. It can be the springboard for a more complex portfolio with additional asset classes as the portfolio value and investor confidence increases. A simple portfolio construction approach is to find a prefabricated one that suits your needs. A so-called balanced portfolio is typical for someone with a moderate risk tolerance. The simplest incarnation would be a portfolio constructed of a stock mutual or exchange traded fund and a bond fund, both based on domestic (US) assets. A moderate risk portfolio would have, for example, 60 to 65 percent in stocks with the rest in bonds. More realistically, your portfolio would contain additional asset classes including domestic and foreign assets, real estate, and more. A good example is the 7Twelve® Portfolio developed by Craig L. Israelsen, Ph.D. It's a prefabricated portfolio that can be adapted to individual requirements. The website is informative and might be all that you need. One step beyond a prefabricated plan is an automated plan. A portfolio is tailored to your situation using a risk/reward questionnaire and computer algorithms that determine the optimum mix of assets matching your risk tolerance. The objective is to find your particular sweet spot on the efficient frontier. The net result is a list of investments (often low cost index funds) and the proportions -- your personalized recipe. The term robo-advisor has come into vogue in the past few years. It refers to an investment advisor (not financial planner) that primarily uses computer algorithms to specify a portfolio matching your risk tolerance. A portfolio constructed this way is something between an off-the-shelf prefabricated plan and a custom plan. You don't get the personal attention of a "full service" advisor, but the management fee is usually much lower. Robo-advisors generally don't charge a fee for the plan, which is automatically generated once your risk boundary is established. They charge an annual fee to manage your portfolio, typically 0.25 percent of your portfolio value. Imagine that your portfolio is worth $500,000. That's $1,250, every year. These companies work primarily online. You can often perform the risk/reward analysis and obtain a proposed portfolio without any commitment. This can help determine if the advisor's recommendation matches your requirements. You can implement the portfolio yourself, saving the management fee. See the adjacent resources section for a list of some robo-advisors. As an example, Wealthfront has friendly and informative web site that allows you to get a detailed portfolio recommendation without any commitment. An "invest now" button (or something similar) on their home page will get you started. Hiring a financial professional to produce a portfolio blueprint is similar to hiring an architect to design a house. You pay a fee for the service. You can use the blueprint as a guide during construction. In the case of a house, it's almost certain that you will contract the actual construction. This might be done by the construction division of the architectural firm. In the case of a portfolio, it is well within the ability of most investors to do their own construction. Check the adjacent resources section for links that can help you locate planners/advisors in your area. If you engage a planner/advisor, make sure that you don't just get a sales pitch. Ask for a written statement specifying that they will have a fiduciary relationship with you. You should assume that any non-fiduciary relationship puts you at risk of dealing with someone who has a conflict of interest. The preferred approach is to hire a fee-only professional. Ideally this will be a certified financial planner (CFP®) or a registered investment advisor. Be prepared to collect statements from all of your existing accounts including investments and debt in order to present a complete picture to the planner/advisor. A comprehensive plan will consider your social security and private pension status, if any. It may delve into insurance as well as tax and estate planning. You might not need all of this to get your portfolio on the right track. But it's good to know that such services exist. Now, back to specifics for your portfolio. Make it clear in advance that you want a plan that describes the asset classes and proportions (i.e., the recipe) that fits your needs. Insist that you receive a list of the specific investments and which asset classes they represent. Be sure that you get a clear understanding of the rationale behind the plan. Tell the planner/advisor that you want to have the option to execute the plan on your own. Be very skeptical if that seems to be a problem. Many registered investment advisors wear two hats. One is the planning hat, a financial architect. The other is a portfolio management hat. You pay a direct one-time fee for the plan. The advisor will really want to manage your portfolio, for an additional fee. That's where these businesses make their profit. The typical fee is about one percent of your total assets annually, significantly higher than a robo-advisor fee. Imagine that you have $500,000 in assets. The management fee will be $5000, every year. If your portfolio is much smaller, it's likely that the advisor is not interested. Account minimums are imposed by advisors because it's not worth their time to deal with "small accounts." The Asset List specifies the specific group of stocks, bonds, funds, etc. that have been chosen to be included in your portfolio. Each item in the list will be a member of an asset class. As a practical matter, each item is assigned to one asset class. Asset Class Targets define the desired proportions (percentages) of each asset class in the portfolio. At the beginning, your actual portfolio will not match your ideal portfolio. Your actual portfolio could well be a hodgepodge of investments, all cash or something in between. Whatever the case, the next step is to do an initial rebalance. This means selling everything in the actual portfolio that does not belong there and buying items from the asset list in the proportions required to reach your asset class targets. Then the actual asset class percentages will match the asset class targets. The portfolio will be balanced. This section has links to external websites that you may find helpful. This Wikipedia page on Modern Portfolio Theory has an in-depth discussion. Warning, heavy duty math.